Places promises to be an interesting addition to Facebook, and could increase the popularity of location sharing in general. But before you start checking in to every restaurant, movie theater, and bar you visit, here's what you need to know. Just tap the Places icon and you'll see a list of nearby Places. Tap on your location from the list, and you can check in, tag any friends who are with you, and add a status update. When you tag a friend, you will be checking them in if they allow third party check-ins. If your friend doesn't allow third party check-ins, then tagging them will be just like tagging them in a status update. No actual check-in will happen. You can only check in people who are on your Facebook friends list and only when you first check into a location yourself. You can see who else is at your location under the "People Here Now" section for that place. Facebook says all Places check-ins are visible only to friends by default unless your master privacy control is set to "Everyone." For more detailed information about Places, consult PC World's report from Facebook's Places launch event. You can also find more information in this Facebook blog post and the Places information page. Facebook has decided not to wipe other location-based services off the face of the Earth. Instead these services can use Places to enhance their own offerings. It's not entirely clear how this will work, but Gowalla Chief Technical Officer Scott Raymond said in an interview with VentureBeat that Gowalla's plan was to allow users to push their check-ins from Gowalla into Facebook's Places feature. It appears you will also be able to import your check-in badges, pins, and Gowalla passport stamps into Facebook. It should come as no surprise that Facebook is using Microsoft's Bing Maps to pinpoint locations in Places. Microsoft made a considerable investment in Facebook several years ago, and other Microsoft services such as Bing search and Microsoft Docs are already integrated with Facebook. 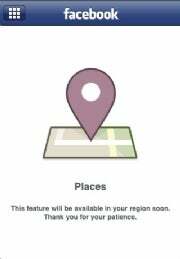 Some have reported seeing messages that Places is not yet available in their area, while others say they can activate Places but the check-in function is not operational. If you're experiencing similar problems, hold tight the functionality is coming soon. Facebook is slowly rolling out the service and will make it available across the U.S. over the next few days, according to TechCrunch. 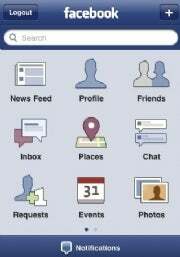 Facebook says it plans on turning on the Read API for third-party functionality on Thursday. What that means is that third-party services will be able to read your check-ins when you interact with those apps as well as the check-ins of people on your friends list (if their privacy settings allow it), according to programmableweb. Any third-party application that wants to use your check-in data must specifically ask you for it when you authorize the app, according to Facebook. However, be aware of some downsides. It appears there's no way to deny access to your Places data and still use the application. So if you want to use an application that requires your Places data, you either must deny the application completely or accept the fact that the application will be harvesting your location data. You can find out more about Facebook's privacy permissions here. The first criticisms over Places and privacy appear to be from the American Civil Liberties Union of Northern California. The civil rights group doesn't like the fact that there isn't a flat out "No" option to stop friends from checking you in. If someone checks you in at a location, you receive a mobile notification that a friend has checked you in. Then you must decide to either permanently authorize third-party check-ins or deny them by selecting "not now," according to the ACLUNC. The concern is that by selecting "not now," the request to authorize third-party check-ins may come up again and again until you finally say yes. Also, if you use Places to check yourself in, then third-party check-ins are turned on automatically unless you adjust your privacy settings, according to the ACLUNC. The ACLUNC also says that the "People Here Now" feature doesn't have enough granular control. The feature only has an option to be turned on (everyone can see your check-in) or turned off (no one can see your check-in). The ACLUNC would prefer to see an option that allows only your friends to see you under the " People Here Now" feature. It also appears that "People Here Now" is turned on by default "if you have previously selected that "Everyone" can see even a single piece of your information," according to the ACLUNC. Have you tried Places yet? What do you think of the new service?